There’s one thing about the Affordable Care Act that almost everyone can agree on: the shift to value has fundamentally changed the healthcare industry. Hospitals and healthcare providers are increasingly being rewarded more for the quality of care they deliver than for the volume of patients they treat. 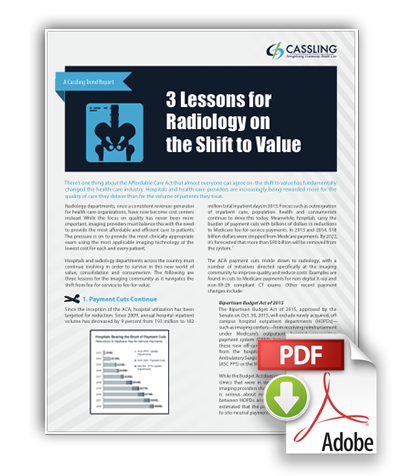 Radiology departments, once a consistent revenue-generator for healthcare organizations, have now become cost centers instead. While the focus on quality has never been more important, imaging providers must balance this with the need to provide the most affordable and efficient care to patients. The pressure is on to provide the most clinically appropriate exam using the most applicable imaging technology at the lowest cost for each and every patient. Hospitals and radiology departments across the country must continue evolving in order to survive in this new world of value, consolidation and consumerism.